Lamborghini is redefining the future of the super sports car with a unique technology demonstrator. Boasting an extremely lightweight construction thanks to advanced carbon-fiber technology, the Lamborghini Sesto Elemento has an overall curb weight of just 999 kilograms (2,202 lb) – including V10 power unit and permanent all-wheel drive. This makes the Sesto Elemento a unique demonstration of the technological expertise of Automobili Lamborghini. Innovative carbon-fiber technologies are being used here for the first time in an automotive application. As a 100 percent subsidiary of AUDI AG, the Italian carmaker also benefits from the undisputed expertise of the German manufacturer when it comes to lightweight construction. With its amazing output of 570 hp, sensational power-to-weight ratio of only 1.75 kilograms per hp and 0 to 100 km/h (0-62 mph) acceleration of only 2.5 seconds, the Sesto Elemento guarantees unparalleled driving fun. At the same time, fuel consumption also drops because of the extreme lightweight engineering applied throughout. The name of this technology demonstrator is derived from the periodic table, where carbon is classified as the sixth element. Thus, the Sesto Elemento demonstrates the worldwide leading expertise of Lamborghini in carbon-fiber reinforced plastics (CFRP) technology. The super sports car brand from Sant'Agata Bolognese is the only vehicle manufacturer in the world to have mastered the complete CFRP process across a range of technologies, from 3D design through simulation, validation, production and testing – all in a state-of-the-art industrial process that stands for the very highest quality standards. Lamborghini drives the technology development in its two research centers the ACRC (Advanced Composite Research Center) and the ACSL (Advanced Composite Structures Laboratory) through collaborations with organizations such as Boeing, with the resulting technology secured under a host of patents. "The Lamborghini Sesto Elemento shows how the future of the super sports car can look – extreme lightweight engineering, combined with extreme performance results in extreme driving fun. We put all of our technological competence into one stunning form to create the Sesto Elemento," comments Stephan Winkelmann, President and CEO of Automobili Lamborghini. "It is our abilities in carbon-fiber technology that have facilitated such a forward-thinking concept, and we of course also benefit from the undisputed lightweight expertise of AUDI AG. Systematic lightweight engineering is crucial for future super sports cars: for the most dynamic performance, as well as for low emissions. We will apply this technological advantage right across our model range. Every future Lamborghini will be touched by the spirit of the Sesto Elemento." 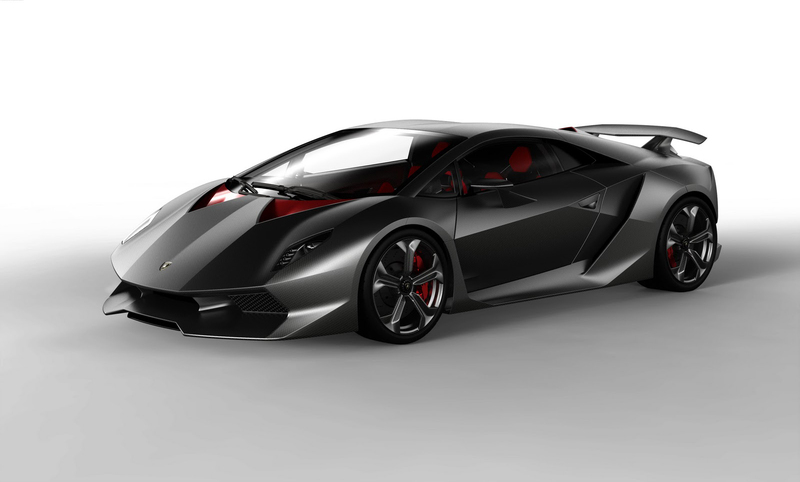 With the Sesto Elemento, Lamborghini's R&D engineers have put together a groundbreaking package. As a pure and radical concept, the Sesto Elemento is the unique synthesis of an extremely low curb weight of less than 1000 kilograms, enormous 570 hp output, the sensitive and prompt responsiveness of the high-revving, naturally-aspirated V10 engine and the superior traction and stability of permanent all-wheel drive – there has never been a super sports car as thoroughbred as this. Sesto Elemento delivers an unbelievable degree of driving fun, concentrated on absolutely sensational dynamics. The basis is an extremely solid, stiff, safe and lightweight carbon-fiber structur: the monocoque cell of the Sesto Elemento. The entire front frame, the exterior panels and crash boxes are also made from CFRP. The Sesto Elemento's major suspension components and the rims are made from carbon fiber. The tailpipes are made from Pyrosic, which is an advanced glass-ceramic matrix composite, able to reach and stand very high temperatures up to 900° celsius. Even the propeller shaft is made of CFRP. The Sesto Elemento demonstrates the outstanding expertise of Automobili Lamborghini in all areas of carbon-fiber technology. Carbon composite materials are a key technology for the automotive engineering of tomorrow, especially for high-performance sports cars. These materials made from carbon-fiber reinforced plastics combine the lowest weight with excellent characteristics – they are extremely stiff and highly precise. Lighter cars improve fuel consumption and CO2 emissions: above all, however, it improves the power-to-weight ratio – the crucial factor for a sports car – and thus the performance. A super sports car built using CFRP accelerates faster, has outstanding handling and better braking. Uncompromising dynamics from the very first glance: the design of the Lamborghini Sesto Elemento displays the sensuality of high performance and possesses the elegance of pure, unadulterated power. The Sesto Elemento lifts the design DNA of the Lamborghini brand to a new level and integrates the functional consistency of carbon-fiber technology into its design language. A clear strength of the CFRP technology is the reduction and integration of components – something that has been used to its full extent in this innovative technology concept. The hi-tech material is visible everywhere. The Sesto Elemento is finished in a new, matt-shimmer clear coat, meaning that the CFRP structure can be seen throughout. Yet the Sesto Elemento is not just black; during the final stage of production the carbon fiber parts receive a newly developed and patented coat. Nano-Technology makes it possible to add fine crystals with a red shimmer. Surfaces covered with this type of finish glow red and deliver an outstanding effect. Further, the surface is particularly robust. On a Lamborghini, every single line has a clear function; the two vertical ribs at the front, for example, improve the stiffness of the component and guide the cooling air directly to the radiator behind them and to the brakes. This guarantees the thermal wellbeing of the components even under the toughest race track conditions. The cooling air flows through two red triangular openings in the hood beneath the front windscreen and through large outlets in the side panels behind the front wheels. Sharply cut headlamp units complete the front end. Reduction is the name of the game here, too – alongside the bi-xenon lamps, there are four LEDs in each unit. The low front end looks incredibly dominant, with the partially double-lipped front spoiler pushed way out front and distinctively formed air intakes. The entire side profile is cut like a sharp wedge, with the power center of the car unmistakably just in front of the rear axle. A distinctive sideline starts at the front wheel arch, rises along the door towards the rear and ends at the broad shoulders above the rear wheel. The triangle – like the one around the door handle - is a recurring design theme, defined by the precise contour edges in the Sesto Elemento's CFRP body. The points of the air outlet triangles in the hood are carried through into lines along the roof. The extremely wide sills form a connection between the air outlets behind the front wheels and the large air inlets in front of the rear wheels. These compartments house components such as the radiators for cooling the engine and transmission oil. The rims have a five-spoke design and are made entirely from carbon fiber. They offer a clear view of the high-performance brakes with carbon-ceramic discs. The Sesto Elemento's rear overhang is extremely short and, again, defined by optimum aerodynamics. The generously dimensioned spoiler is perfectly matched to the diffuser and a further air deflector in the center, thus guaranteeing maximum downforce for extreme cornering speeds and excellent high-speed directional stability. The Pyrosic tailpipes are directed upwards through the engine cover panel, which also incorporates ten hexagonal openings and two air scoops behind the roof for delivering fresh air to the V10 power plant. 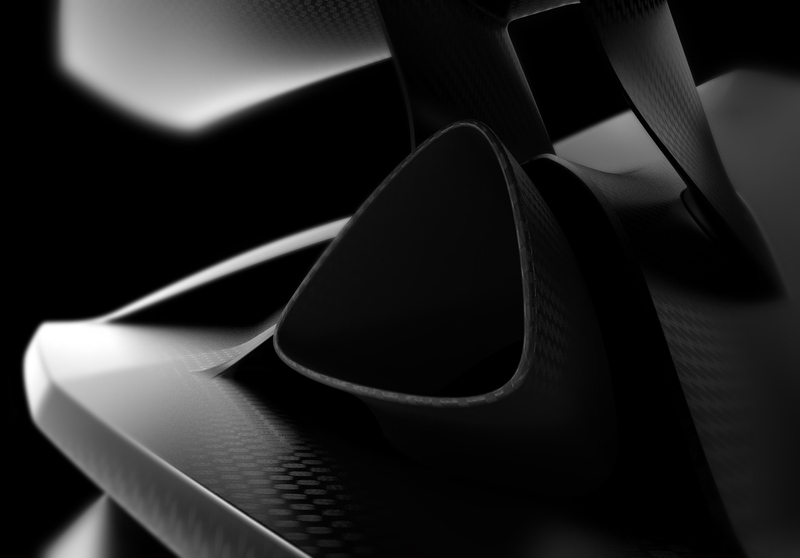 A major strength of carbon-fiber technology is that complex structures can be integrated into one single component. This improves quality and reduces weight. 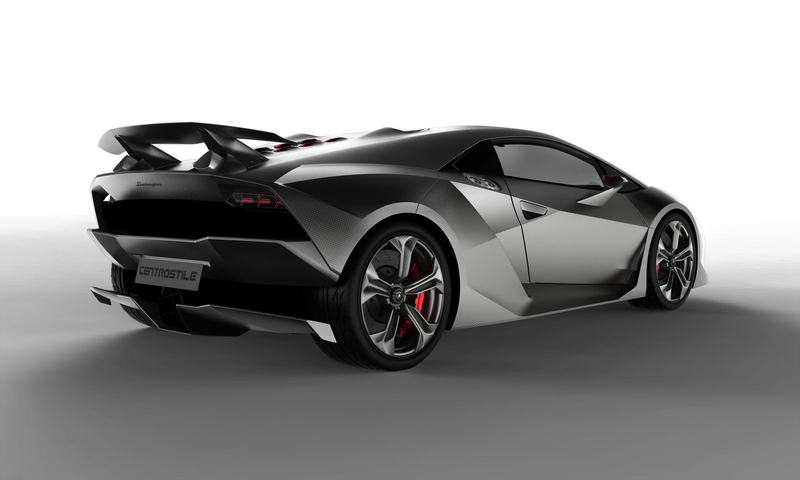 On the Lamborghini Sesto Elemento, the front and rear of the body-shell are each manufactured in a single piece. Engineers call this "cofango", created by combining the Italian word "cofano" (hood) with "parafango" (fender). The large components are attached by using easily removable fasteners, in order to have fast component disassembly. The "cofango" is also reminiscent of an icon from the brand's history: in 1966, the legendary Lamborghini Miura was unique as a mid-engine super sports car – and its rear cover, too, could be opened in one piece. The minimalist approach has also been applied to the interior, starting with the seats. Lamborghini has dispensed completely with the conventional seat frame. In fact, the whole internal structure is obtained and defined directly from the Forged Composite tub, that on one side plays a functional role and on the other side is the base for the optimally formed seat cushions, upholstered in hi-tech fabric, which are affixed directly to the carbon-fiber monocoque. The correct ergonomics are provided by the steering wheel, which can be adjusted for height and reach, and by the pedals, which can be electrically adjusted longitudinally. Of course, the designers of Lamborghini Centro Stile also dispensed with interior trim in the classic sense. The dominant visual feature throughout is the functional CFRP material – on the floor and roof of the monocoque, on the doors and also on the cockpit and center console. Even the electronic control unit for the engine is mounted in plain sight – a very special kind of hi-tech aesthetic. The triangular cut-out is also evident as a design feature – wherever material can be removed in the interest of weight reduction. The controls are presented in a highly concentrated format. The instruments provide information primarily on engine and road speed, as well as all parameters relating to engine condition. Only three piezoelectric buttons grace the center console – one to start the engine, one to shift into reverse gear and another one for the lights. The Sant'Agata Bolognese engineers had set themselves a target that was more than ambitious – despite the ten cylinders and 570 hp, despite the exceptionally fast-shifting e.gear transmission and even despite the permanent all-wheel drive, the Sesto Elemento still had to stay below the 1,000 kilogram mark. And that target was achieved; at a curb weight of 999 kilograms, each hp produced by the V10 power unit has to accelerate only 1.75 kilograms – a sensational figure. 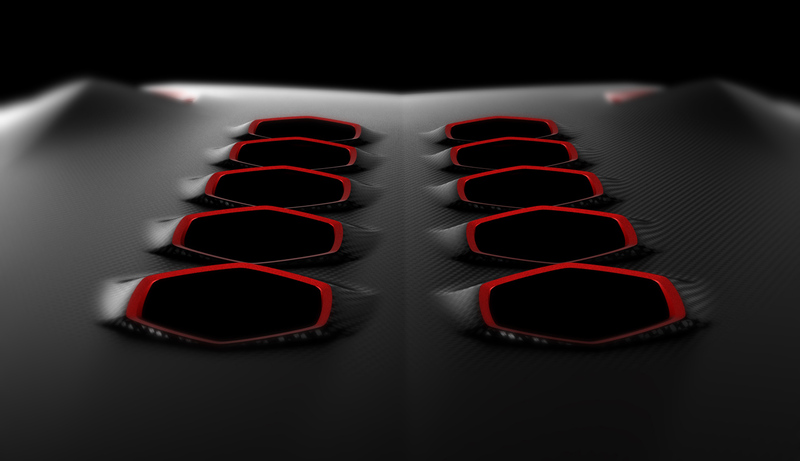 This was made possible by the systematic and intelligent use of state-of-the-art carbon-fiber technologies. Lamborghini possesses extensive experience in the field of lightweight engineering, gathered over many years: something clearly demonstrated by the brand's series production vehicles. The current Gallardo LP 570-4 Superleggera has a dry weight of only 1,340 kilograms, marking a competitive best in this category of super sports cars. Compared with the already extremely lean Gallardo LP 560-4 Coupé, this represents a further reduction of 70 kilograms, resulting largely from the use of carbon fiber in the body-shell, interior and technical components. Lamborghini engineers stuck firmly to this approach for the Sesto Elemento. Its structure consists almost entirely of carbon fiber and is built using the monocoque principle. Monocoque means that the vehicle's load-bearing structure is manufactured as a single shell, with the physical properties of one component, and thus makes optimum use of the extreme stiffness offered by CFRP materials. Formula 1 racing cars have been built using CFRP monocoques for decades – and regularly provide clear evidence of their collision safety. The monocoque in the Sesto Elemento, however, is made using innovative Forged Composite technology – the first time this has been done in an automobile. The advantage of the Forged Composite is that the monocoque is obtained through a one-shot process. 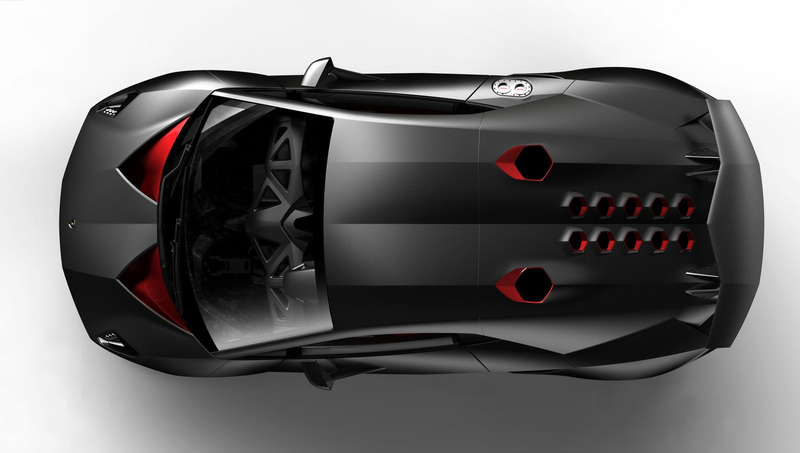 In the Lamborghini Sesto Elemento, the monocoque forms the complete passenger cell. Connected to it are the front subframe - incorporating the suspension points - and the crash boxes, both also made using specialized carbon-fiber technologies. The extreme stiffness of this assembly guarantees not only a very high level of safety, but also unparalleled handling precision. The rear subframe with the engine mount and rear axle suspension points is made from aluminum – another lightweight material with which Lamborghini has a great deal of experience. An important element in optimum construction using CFRP technology is the maximum integration of functions. Thus, the body-shell exterior is made up only of the roof section, which is part of the monocoque, the two "cofango" covers front and rear with integrated aerodynamic components and the doors. Each door consists of only two elements, the exterior skin and the interior cladding, both of which are also permanently bonded to create one component. The suspension and the area around the engine have also been optimized with lightweight engineering. Alongside aluminum components, there are also carbon-fiber control arms: innovative Forged Composite technology is also well-suited to this kind of high-load part. These components are around 30 percent lighter than comparable aluminum parts. The propeller shaft is also made of CFRP by using Wrapping technology. This solution allowed the Lamborghini engineers to get rid of the central joint, bringing an important weight saving. The rims are also made from CFRP, while the brake discs are from carbon-ceramic composite material. A similar composite material is used for the tailpipes on the exhaust system – the compound of ceramic powder and synthetic resin makes this carbon material extremely heat resistant. A large number of screw fastenings feature a special titanium alloy and joining technology from the aviation sector. Forged Composite: Here, materials with short carbon fibers are hot pressed in a mould. The process facilitates complex structures and is used for parts such as the underside of the monocoque and the suspension arms. Prepreg: The carbon-fiber mats are soaked in a thermoset liquid resin. They are pressed in moulds and cured in an oven under heat and pressure. Prepreg components have a very good surface finish and are therefore the preferred choice for use in visible areas. The fascinating heart of the Lamborghini Sesto Elemento is familiar from the Gallardo LP 570-4 Superleggera. 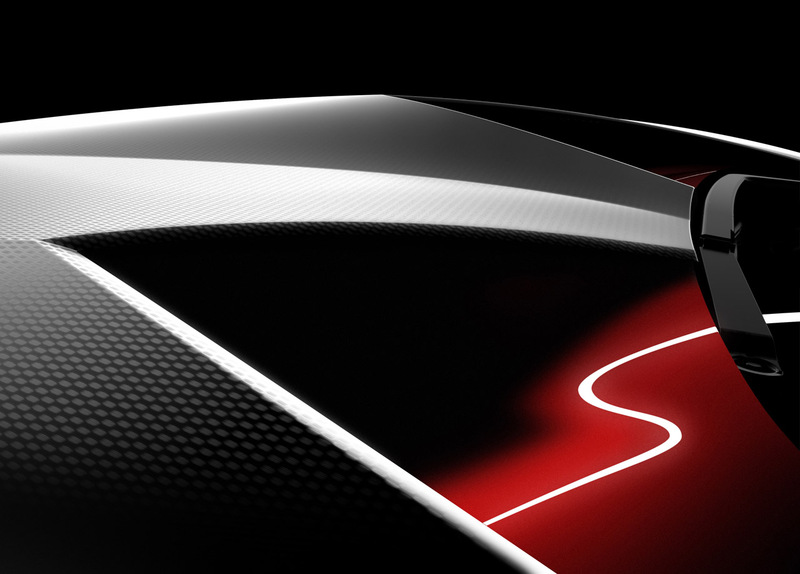 In the Sesto Elemento too, the V10 unit is mounted "longitudinale posteriore" – longitudinally behind the driver. The 570 hp output equals 419 kW, all of which is available at 8,000 r/min. The pulling power is just as impressive – with the torque curve peaking at 540 Nm and 6,500 r/min. The V10 offers 5,204 cm3 of displacement, delivering a specific output of 80.5 kW (109.6 hp) per liter of displacement. The highlights of this long-stroke engine with an aluminum crankcase include dry sump lubrication and a cylinder angle of 90 degrees. Both solutions are an integral part of the lightweight engineering approach, as well as serving to lower the center of gravity and thus tighten the handling characteristics. Ideal combustion chamber fill comes courtesy of a switch-over induction system and continually variable, chain-driven camshafts. Every single kilometer in the Sesto Elemento is sheer fascination – due in part to the relentless traction delivered under practically all conditions. This is largely attributable to the permanent all-wheel drive system. It incorporates a central viscous coupling and a self-locking differential for the rear wheels with 45 percent lock. Thanks to this superior traction, Lamborghini drivers can accelerate earlier out of a curve than those in rear-wheel drive cars. Lamborghini possesses many years of experience with carbon-fiber reinforced materials. As far back as 1983, it produced the first prototype CFRP chassis for the Countach, with the first series production parts appearing in 1985. The current Lamborghini Murciélago is made largely from CFRP – its body-in-white contains 93 kilograms of carbon-fiber materials. The engine cover panel of the Gallardo Spyder is one of the largest CFRP components with class A surface quality in the automotive world. The company is now working steadily to expand its worldwide leading position. The new Advanced Composites Research Center (ACRC) at the company headquarter in Sant'Agata Bolognese is working on innovative construction and production methods for carbon-fiber elements in automobile design. The Advanced Composite Research Center in Sant'Agata Bolognese secures leading-edge research on innovative materials and production methods for carbon fiber elements for small production volumes. Here, over 30 experts develop vehicle components of all shapes and sizes. They build prototypes and the associated production tools while developing optimized production technologies. Sophisticated systems largely developed in-house allow extremely high precision levels as engineers simulate manufacturing processes as well as carry out crash tests on complex carbon-fiber structures. Thanks to the extensively patented "RTM Lambo" process, Lamborghini can use minimal pressure and relatively low temperatures to manufacture carbon-fiber components to the highest levels of quality, precision and surface finish, from small parts to complex vehicle structures. Further benefits include higher process speeds, lower costs, and extremely light tooling. The Lamborghini Advanced Composite Structures Laboratory (ACSL) at the University of Washington uses experimental tests to define the mechanical behavior of the different materials and technologies using methodology from the aviation industry. The team of research engineers in Seattle works with very specific instruments and methods in close cooperation with the R&D headquarters and the ACRC in Sant'Agata Bolognese. 0 أفضل 100 جمله سينمائية على الميكروباصات والتوك توك..
0 هوندا اكورد كروس تور ... شطاره دي و لا خيابه !! 0 فيراري .... المشروب الرسمي لهولندا !!! يا ترى جاهزين لتجربة السواقة اللى جاية ؟؟؟؟؟!!!!!! !